For generations of mariners, a tangy, almost sweet odor served as a signal that land was nearby. What sailors called “the smell of the shore” had the opposite meaning to landlubbers, who would catch the same sweet scent wafting over the waves and think of it as “the smell of the sea.” Seabirds probably don’t have a name for it, but the odor means something to them, as well: the opening of an all-you-can-eat buffet. DMS does far more than ring the birds’ dinner bell, though. Scientists believe it represents a large source of sulfur going into the Earth’s atmosphere. As such, it helps drive the formation of clouds, which block solar radiation from reaching the Earth’s surface and reflect it back into space. If DMS production is speeded up by global climate change, as many scientists believe it will be, then it could provide a cooling effect. That means DMS could help offset greenhouse warming. That hopeful claim has been made for more than two decades. In 1987, British chemist James Lovelock and several colleagues popularized an idea first proposed by others that algae might play a vital role in regulating the Earth’s climate. Lovelock is famed as the originator of the Gaia hypothesis, which suggests that the Earth functions as a single living organism and maintains the conditions necessary for its own survival. By encouraging cloud formation, Lovelock theorized, DMS might help keep the Earth’s thermostat at a fairly constant temperature. But scientists still understand very little about how and why marine algae make DMS, how it moves through the food web in the upper ocean, or how much of it gets into the lower atmosphere. Despite its potential impact on climate, the amount of attention focused on DMS remains relatively small, and scientists continue to be uncertain whether it can make a major difference in global climate change. John Dacey, a biologist at Woods Hole Oceanographic Institution (WHOI), is one of the few marine scientists who have devoted a great deal of time to studying oceanic DMS over the past few decades. He says he’s amazed and dismayed that carbon dioxide receives so much research funding right now at the expense of other basic science, when other gases may have critical roles to play in countering or augmenting warming. 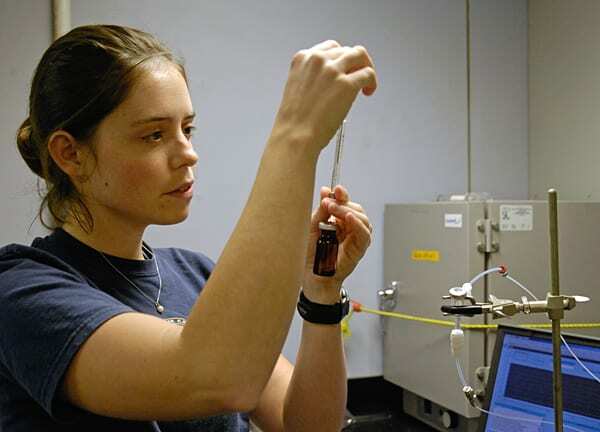 Dacey has long investigated the processes that control how environmentally important gases are exchanged between Earth, ocean, organisms, and the atmosphere. He explored the little-understood role that plants play in influencing greenhouse gases. Dacey was the first to show how vegetation transferred methane to the atmosphere, and he demonstrated that DMS is emitted from the leaves of certain species of marsh grass. Scientists had previously thought the gas was coming from the sediment around the grass. For the ocean, Dacey has also developed ways to track the exchange of DMS from sea to air. He is also studying how a molecule called dimethylsulfoniopropionate, or DMSP—the source of DMS—concentrates in organisms in the marine food web. These are critical but difficult measurements to make. 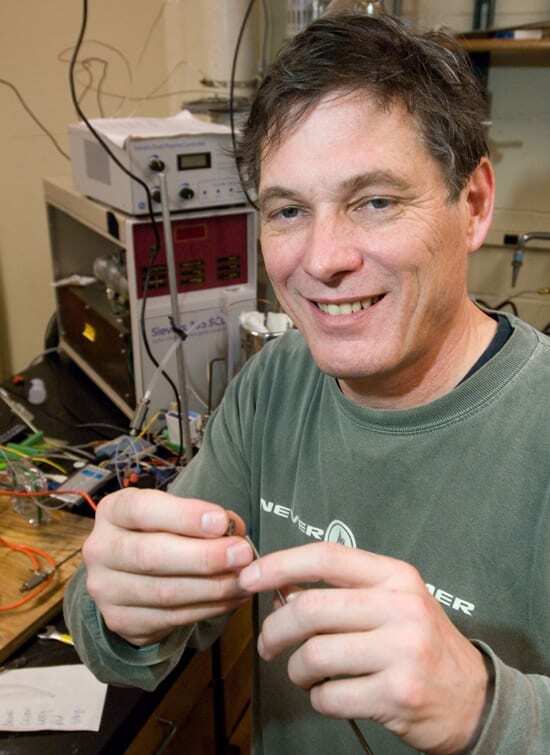 Dacey’s work over the decades on the dynamics of dissolved gases has required him to develop better measuring tools, including automated devices that allow researchers to sample repeatedly in order to detect changes. In Dacey’s ongoing efforts to find better ways to measure DMS, he had collected three years’ worth of measurements on DMS concentrations in the Sargasso Sea off Bermuda. But this unique set of open-ocean data remained unanalyzed until scientists such as Toole recognized its potential. DMS attracted Toole precisely because so little was known about it. 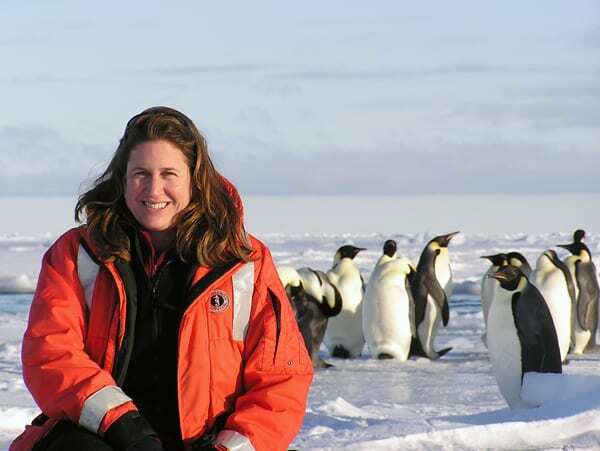 With degrees in chemistry, geography, and marine science, Toole wanted a specialty that spanned her many interests. DMS offered all of that, and the sweet smell of mystery, too. When spring comes to the Ross Sea, just off Antarctica’s largest ice shelf, the ice begins to melt, and sunlight reaches nutrient-rich waters that have welled up from the ocean’s depths to the surface. The result: One of the largest, most predictable algal blooms in the world. “You get a huge explosion of phytoplankton,” Toole said. Phytoplankton are tiny, single-celled floating plants that live near the ocean’s surface where enough light reaches to support photosynthesis. They’re the base of the ocean’s food web. Toole and several colleagues have sought out the Ross Sea algal bloom for the past three years aboard an icebreaking ship. For a couple of weeks, the scientists have the phytoplankton all to themselves. 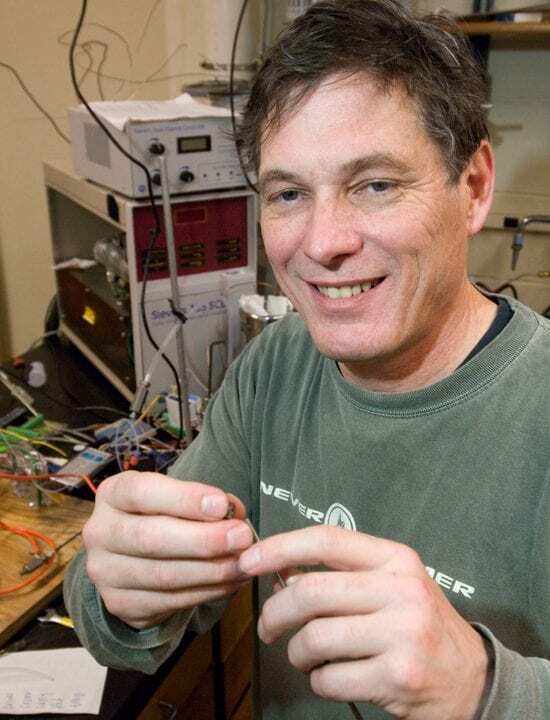 “It’s almost like working in the lab,” Toole said. Every morning, Toole took samples from the ocean, snapping the tops on bottles at different depths to collect the algae. In their cells, the phytoplankton synthesize DMSP. Physiologists aren’t sure why the algae need DMSP, but they speculate that it could have something to do with regulating salinity or temperature inside algal cells. In cold environments, DMSP may act as a cryoprotectant, keeping the cell from freezing. 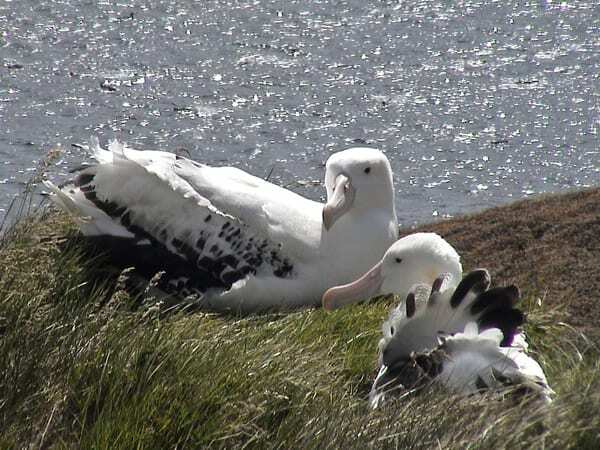 Some researchers have guessed that DMSP acts as a chemical repellant that helps deter predators. Toole is more convinced that light—particularly ultraviolet light—explains why the algae produce DMSP. Working with David Siegel, a professor of geography at the University of California, Santa Barbara, Toole found that phytoplankton appear to convert DMSP into DMS when they’re stressed by ultraviolet radiation from the sun. The DMS flushes out chemically reactive molecules that cause cellular damage, in much the same way that our bodies use antioxidants to bind to free radicals. “Phytoplankton respond dramatically to UV radiation stresses,” Siegel said. “This response is incredibly rapid.” Siegel and Toole documented their research in May 2004 in the journal Geophysical Research Letters. As long as the algae are left alone, the DMSP stays relatively intact inside their cells, although some DMS leaks out and begins to make that DMS smell. Soon enough, though, once the algae in the Ross Sea have reached full bloom, zooplankton arrive and begin chowing down on them. DMSP spills out of munched-on algae into the ocean. Once DMS has moved from the ocean to the air, it starts to play an entirely different role: cloud maker. DMS is chemically reactive and can’t last long in the atmosphere. It quickly gets converted into a variety of sulfur compounds that serve as aerosols. They allow water vapor to condense around them. This is how clouds are made. Clouds, of course, have a major impact on the Earth’s climate. They deflect solar radiation back into space, preventing sunlight from heating the Earth’s surface and providing a cooling effect. Clouds are even more important over oceans, which are both more extensive and darker than land and so absorb a majority of the heat hitting the planet, Toole said. So the question becomes, can algae produce enough DMS to increase cloud cover and keep the planet’s temperature from rising? “DMS is undoubtedly part of the system of checks and balances that keeps the climate from taking wild swings,” said Ron Kiene, a professor of marine sciences at the University of South Alabama and one of the world’s leading DMS researchers. Putting sulfur in the atmosphere, as with DMS emissions, is a more efficient way of cooling the atmosphere than removing carbon dioxide. So it might be possible for the natural feedback mechanisms of the biosphere to use DMS to limit global warming, he said. Recently, Dacey spent a week in Barrow, Alaska, calibrating an automatic system for measuring very low volumes of DMS in the air. He hopes the measurements made at Barrow will reveal whether a scenario that starts with melting sea ice and leads to more open water, more phytoplankton, more DMS in the atmosphere—and hence greater cloud cover—will offset an increase in solar radiation absorbed by dark open water, rather than reflected by white ice. DMS also comes into play in less natural, more intrusive proposals to remedy greenhouse warming. Proponents of ocean iron fertilization—seeding the oceans with iron to increase the growth of marine plants that absorb the greenhouse gas carbon dioxide—could have a potentially beneficial side effect. (See Fertilizing the Ocean with Iron). 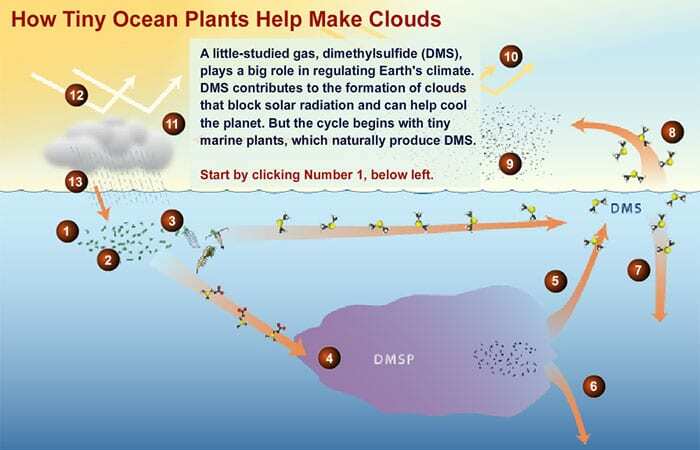 More phytoplankton could produce more DMS and more clouds. Toole and Siegel’s research into the role of UV radiation could potentially strengthen the case for algae’s role in climate control. “Based on what we’ve seen and our research, there will be more DMS,” Toole said. As the oceans warm, the upper layer of the ocean is expected to get shallower. That means phytoplankton will be trapped closer to the surface, where they’re exposed to more UV light, stimulating more DMS. “The shallower the layer they’re trapped in, the more DMS they’re going to make,” Toole said. Toole and some of her colleagues are currently inputting their data from the Ross Sea and Bermuda into climate models to see if an increase in DMS production is enough to affect global temperatures. But the answers are anything but straightforward, because simply adding more clouds sends complex ripples through the entire system, she says. Toole, Dacey, Levine, and others will continue to ask the questions, though. One thing that’s sure about DMS: There’s still a lot to learn. Funding for this research came from the National Science Foundation grant OCE-0425166. Naomi Levine, a graduate student in the MIT/WHOI Joint Program, is studying a critical but little-known process called the "bacterial switch," by which a compound made by phytoplankton called dimethylsulfonionpropionate (DMSP) can be broken up by bacteria in two different ways. Each route leads to different impacts on the environment.